TomFoodery: WHAT WAS THAT YOU SAID? 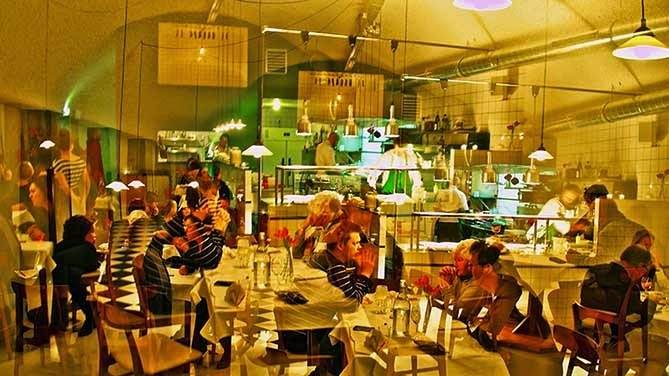 An English acoustician, Jeremy Luscombe, published a terrific piece about his work to reduce restaurant noise, and he was kind enough to open it with a reference to a piece of mine that was published in Zester Daily some while ago. Click here to see Luscombe's piece. One thing you didn't mention, which I barely touched on in my piece but which I've been wondering about since, is the question of how noise raises levels of adrenaline, norepinhephrine, and (worst) cortisols, in effect creating the sensation of anxiety and even fear. Those of course can be mollified by further intake of alcohol and food. Up go sales. And like the idiots who combine Red Bull and vodka, the victims of this (perhaps sometimes unconscious?) stratagem believe that the combined effects of simultaneous excitement and calming--at war with each other, as it were--are tantamount to "having a good time." Loud laughter, the camaraderie of the whole group being in the altered state together (thus some moderation of the underlying sense of fear), and general disinhibition are exactly what you get in these goddam places, and exactly what increasing numbers of young people have learned to identify as markers of having a good time. Good conversation is out the window. And we adherents of conversation are out of the restaurant, not to return.